1. BCIT was the victim of a crime. It is no offence to be a victim of crime. 2. TM did not know how to handle this and nor did anyone else. 3. TM turned to the SEC for assistance and for sweet FA. 4. The brokers sold at least 1.3 billion shares which they did not have. 5. The brokers have taken your money. 6. The brokers have wilfully refused to deliver your shares. 7. The decision to sue the shareholders was on the advice of the SEC and DTC. 8. The cusip number clerical error which prevented the company trading and led to it being de-listed cannot or will not be explained by FINRA. 10. FINRA did not inform the company or other relevant parties that this name change had not been completed. 11. FINRA are unable or unwilling to explain why the name change did not get completed and why they did not advise the relevant parties. 12. Because of the actions of FINRA misleading statements were filed with the SEC. 13. The DTC lock remained in force after the identified fake shares were ratified by the court case. 14. The combination of the global lock mean that although the company was still listed on the pink sheets it was in reality a none reporting grey public company. 15. Unable to generate income it could not keep paying the SEC fees for filing. 16 The SEC revoked a company called Energy Source NOT Bancorp. There is nothing in those proceedings to say that ES was BCIT. 17. No fake shares have been identified or recovered since the aforementioned court case. 18 The fakes shares are now an irrelevance. All that matters is what is on the Transfer Agents register. 19. FINRA have stated in writng that despite the fact they are supposed to protect investors they have no responsibility to you who invested in BCIT. Discussions about the controller on the certs, the restricted stamp, TM did this and TM did not do that, are LOB and simply efforts to distract you all from the truth of what has happened. The brokers took your money and sold you shares they did not have. Recent News For Bancorp International Group, Inc.
Pressbox (Press Release) - Bancorp International Group Inc (BCIT) announces that they have acquired the option to acquire two magnetite sites at Manetai and at Aropa PNG, on the basis of a joint venture with the landowners. This venture has the approval of the MMG who will obtain as and when needed any other consents and licenses to enable mining to commence. This is a development project, as the existence of the deposits have already been established, the precise size of the reserves are subject to survey, but are believed to be valued conservatively at minimum of $30 million. This supplements BCIT's interest in a commodity trading business which commenced operation in 2014. DTC participants need to acquire BCIT shares in order to settle aged fails in accordance with DTC instruction contained in DTC release B0846-11. Sperry Younger, Managing director at J. STREICHER CAPITAL LLC (Streicher), is pleased to announce that Streicher has entered into an agreement with Bancorp International Group Inc (BCIT) to act as Consultant so as to enable DTC participants to acquire BCIT shares in order to settle aged fails in accordance with DTC instruction contained in DTC release B0846-11. J. Streicher Capital LLC is a U.S. FINRA member Investment Banking firm concentrating on providing unique and creative financial solutions to public and private companies spanning the small-cap, mid-cap and large-cap markets around the world. The firm is comprised of a diverse group of successful professionals with Investment Banking, Fund Management, Asset Management, International Business, Brokerage, Securities and Entrepreneurial backgrounds who utilize their collective experience to provide clients with high quality results. In August 2011 DTC informed Patricipants that aged fails should be settled outside of DTC. 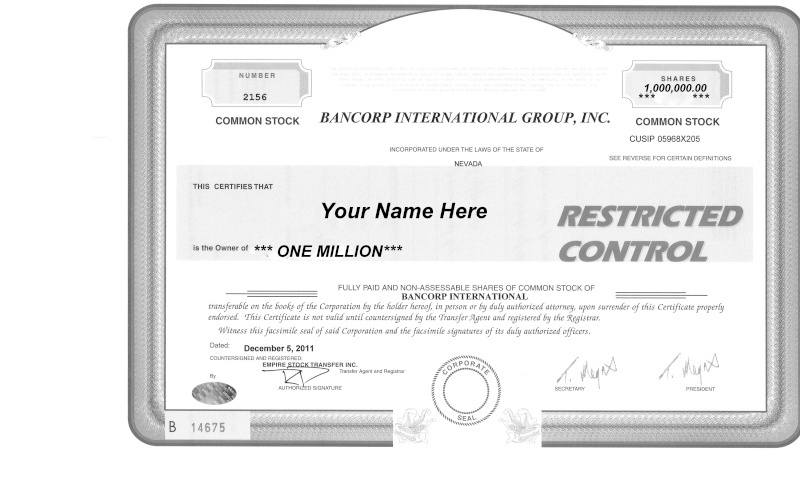 August 8, 2012 -- On February 8, 2012 and March 13, 2012 Bancorp International Group Inc. (the "Company") wrote to a number of its shareholders holding certificates of its common stock with former company names and inactive CUSIP number 05968x106 informing them that the Company was carrying out a mandatory exchange of all these old certificates for new common stock certificates with the active CUSIP number 05968X205. Should a shareholder fail or refuse to comply with this final demand by the close of business 5:00 P.M., Pacific Time, on Wednesday August, 15 2012, they are advised that the Company will be obliged to pursue any and all available legal and equitable remedies, including an award of legal fees, costs and expenses incurred by the Company. The Company sincerely hope this will not be necessary, but please do not doubt our resolve to enforce this demand for the exchange of certificates. April 19, 2012 -- BCIT informs Investors to send details of their share purchase. This follows the uncovering of major discrepancies between shares declared to Broadridge by Brokers and those believed to have been purchased by Investors. accurate accounting of all shareholders, and their share amounts, as we progress. shareholder and be eligible for inclusion in Bancorp's future as it moves forward in its business endeavors. April 06, 2012 -- BCIT informs Investors to expect a letter from Broadridge in the next few days. This follows the uncovering of major discrepancies between shares declared to Broadridge by Brokers and those believed to have been purchased by Investors. March 30, 2012 -- Share Certificates in BCIT have been issued to TD Ameritrade, Etrade, Scottrade, Schwab & TD Waterhouse Canada as a gesture of goodwill by BCIT to help the recipients in their dealings with customers who are BCIT Investors. March 20, 2012 -- The exchange of certificates is to ensure the security of all legitimate Shareholders in the company and to provide clarity and uniformity in the market place. February 06, 2012 -- Mandatory Share Certificate Exchange is to resolve issues affecting the settlement of trades in its common stock, provide clarity and uniformity in the market place and to ensure the security of all legitimate shareholders of the Company. January 11, 2012 -- BCIT confirms that Carlton Huxley continue their work for the Company, that the Transfer Agent is Empire Stock Transfer Inc of Henederson Nevada, the active CUSIP is 05968X205 and that DTC's system indicates there are no chills on BCIT securities. Energy Source Inc ex BCIT Announces it will Act as Depository and Clearing Agent for its Shares in Lieu of the DTCC and is Pursuing its Renewed Commercial Activities. December 03, 2011 -- Energy Source shares are no longer DTC eligible & as a result DTC has no involvement with these securities as a result of which, the DTC global lock no longer applies. BCIT/Energy source and the official Transfer Agent, Empire Stock Transfer Inc, will be act as depository and clearing agent in lieu of DTC enabling shares to be delivered to those who have purchased them from brokers. April 17, 2012 What does Cefaco have to do with BCIT? Megas, "Everything"
April 16, 2012 Megas (Cefaco) has sole assignability for 70 years over Atmo property in Bougainville. April 14, 2012 I also have faith in Thomas Megas. I know you have done your part as a shareholder to continue to fight for justice here. ATTN: for those who have questions about deleted posts, please use this format from now on.